Inspired by the famous Waldorf salad, our red fife and kale combination makes for a satisfying meal on a summer evening. 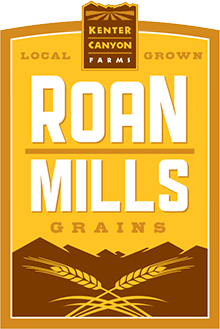 Accompany with a loaf of rustic Roan Mills bread and a refreshing glass of wine. This dish is vegan and vegetarian friendly. Combine ingredients in large bowl, salt and pepper to taste. Combine 1/8 cup of sunflower oil with 2 tablespoons walnut oil and 3 tablespoons champagne vinegar. Pour this over the salad, toss and taste. If it's flat add a little salt and a splash of vinegar, if it’s not rich enough add some walnut oil. Toss and taste. This salad can be served right away or held for a day in the fridge.